Sometimes, I ache for the shadows of what we have lost. In the prosperous market town of Henley on Thames, renowned for its regatta, one can walk past the town hall and up Gravel Hill, away from the hurly burly and designer outlets, away from the churches and the River Thames. And you will become aware, after a little while, that you are walking next to a cobblestone wall. It is extremely high, and affords those on the other side unparalleled privacy. It has a small arched gate at one point, leading down a little path. It is quite old – 18th century – and it is a grade II listed wall. Yet on the other side, there is no monastery garden; no great country house. Rather, there is a housing estate dating from the 1970s. Great, worthy old Paradise House was demolished in the 1960s. Incongruously, the wall culminates in a grand pair of iron gates which now open onto a small and most modern, convenient house. The wall continues in its mind’s eye to enclose what it has lost, hugging its loss to itself, a grizzled old reminder of an age gone forever.But behind that wall began a story which became infamous; a story whose shadows continue to play on the walls of the town to this day. The walls were the unforgiving boundaries of Paradise House. A son is a son till he takes a wife, but a daughter’s a daughter for the rest of her life. And Francis Blandy, a well-off Oxfordshire lawyer and the town clerk of Henley in the 1740s, had a daughter who could not, it seemed, be married off. And so, as was often the way, he settled a fat dowry on Mary. Her husband would receive £10,000 on marrying her. Lo and behold, behind the walls of Paradise House, a suitor appeared out of the ether. It was at a garden party that Mary met Captain the Honourable William Henry Cranstoun. A dashing partner with all the charm and wit a woman could wish for. They hit it off instantly and it seemed a perfect match had been made. Mary’s father was overjoyed. Right until the moment the Captain’s uncle, owner of Paradise House, Lord Mark Ker, took Francis aside. It seemed the captain was already married. Francis was horrified. Immediately he ordered that Cranstoun never contact Mary again. But £10,000 in the 18th Century was a mighty powerful incentive. And the Captain had Mary’s heart already; they continued to correspond, and presently a small package arrived in the post at Mary’s home. It was from the Captain; and it contained a ‘love-philtre’. It was, he said, a set of powders which would change Francis’s mind; and then Mary, the Captain and the £10,000 could be together. Forever. Mary administered the potion in high hopes: but three days later, Francis was found stone dead. The story does not end there. But today, we shall pause at the walls of Paradise House, an ancient old boundary wall, complete with doors and entrance gates, which yearns for the good old days of Lord Ker, his garden parties, and his dissolute nephews. If you enjoyed this story and others on this site , please considering adding your nomination to others for a Shorty Award here. Many thanks. Posted in Places to visit, Quirks of HistoryTagged anglophile, england, ghost stories, Henley On Thames, history, Mary Blandy, Paradise HouseBookmark the permalink. I used to love to walk in Henley Kate. And is that cress in your photo? Seems you can do a foraging blog spot for us! Yikes, poor Mary. I hope she didn’t hang! All will be revealed, I promise …. And they are such very large marquees, Roger: one thing that Henley does conclusively. And at least you were in the first heat. I was reduced to wearing frilly dresses and sipping Pimms with Hoorays who couldn’t seem to string two syllables together. I should have hollered My Fair Lady style: “Come on, Roger, move yer bloomin’ arse! How dastardly! Love the wall, Kate. It has a very distinct character, Nancy. It tells a story, just by standing there. Now, the writers must reason how they would take this tale forward – and then compare with how real life did the job!. What an excellent idea, Col. I’d love to hear how others resolve it. The true story – or the facts as locals tell them – are strange indeed. Of course, if Lord Mark Ker came back into the story to bring William down, it would have been a re-Mark Ker/Bill development! Why is it the Mary’s all seem to have a rough go at life? Ah, well, Kate, I’ll be eagerly waiting for the rest of the story. I do love these photos. It’s a very strange sensation, Penny; standing alongside this thing which is almost 300 years old, yet behind it are comparatively new buildings. It’s all very CS Lewis. Ah, I catch a whiff of George Sanders at his most charmingly disreputable as the dishonorable captain. Reminds me of the film The Heiress, with Olivia DeHavilland and Montgomery Clift. Or a touch of Gaslight? Was the captain as suave as Charles Boyer? Is this the moment to confess I have never seen it, Gale? My education is incomplete. I shall watch carefully and report back. In my book, £10000 must have meant she was either really, shall I dare say, ugly or a real shrew. We have a saying on this side of the pond…she must have been a double bagger. Two bags over her head in case one fell off. I have always been know for my honest opinion which sometimes is not politically correct. Maybe she was both or neither? But £10000 pounds and only one married man stepping forward? In reality, some of my worst dates were with beautiful women on the outside. I looked at the heart. There was something about her, for sure; the story has it written between the lines. She never seemed to register the seriousness of the events which were going on around her. I wonder if she had autistic tendencies. A potion that would change his mind……..HA. Worthy of a movie. Indeed. One would have to be extremely naive to trust the captain. Especially after she found out he was married. Francis was right. The Captain was a no good ‘un. Awaiting – with bated breath – the next installment, Kate. You have the captain taped, Judy. The next episode, if it be possible, is an even better yarn. This is quite a cliff hanger, Kate, with some much anticipated ghostly revenge heading someone’s way in part 2. I just tweeted a nomination for you, but I did it via my own Twitter account. Good luck! Thanks for that, Virginia. most appreciated. Yup: a cliff hanger indeed and ghosts are in store, that’s for sure, later in the tale. You give good ghost, Kate. What a sad story. Of course, I want to know how it ends. But it just seems like setting up for disaster anyway, by announcing this huge dowry. It does, doesn’t it, Banno? Silly thing for her father to do. What a beautiful monument to that history and house – albeit a somewhat colored history, though those are the best kind, aren’t they? 😉 I always find it so sad when you have a forlorn location where something worthy used to stand … and is now gone save for the few rare photos or sketches. My hometown has a notorious boom or bust mentality that saw the destruction of many grande old dames of homes and buildings during the boom of the 60s and 70s, so that now as we are left with the unremarkable, often ugly architecture that replaced it, we can only wonder how different the landscape would have appear had a few more been saved. What a beautiful cobbled wall and a horribly sad story! I, a rather optimistic sort, hope for an upswing in the next installment, but I won’t be holding my breath! I’ve always thought it interesting that everyone seemed to know how much everyone else was worth. Mr. Darcy, Mr. Bingley, Miss King, the Bennett girls–all the incomes and the dowries were public knowledge. How does a father advertise the amount he’s settled on his daughter? Mention it to the town gossip? Or to one of the men at his club? In the States (my part anyway) we would call that a brick wall. “Cobbled” is so much nicer. Yes, the potion surely changed his mind. Shades of Jane Austen’s Persuasion at the start, then a bit more Bronte-esque as events unfold. It really would make a great book/film. I imagine we would have a different mindset when we are dead. 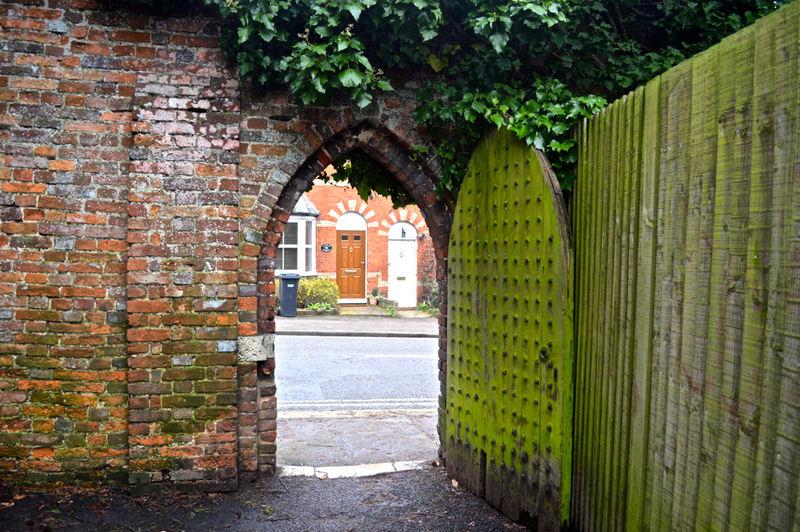 Love your photos of those beautiful old walls and gates. I live inside these walls and walk through the doorway every day, counting my blessings as I go. The large gates, as far as I know, were brought from Friar Park (directly opposite, and the home of the late Beatle, George Harrison. The house inside those gates was self-built by Peter Annereau, then editor of the Henley Standard. The visible ‘scoop’ in the wall is a repair that was done when two lime trees fell over after the great storm. Repairing brick and flint walls to a high standard (were you see very little mortar) is an expensive and specialist job.